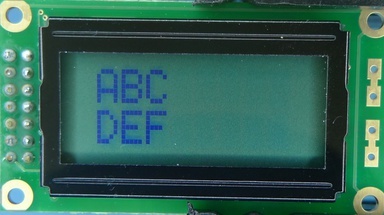 This shows how to map a HD44780 based LCD panel (most LCD panels use the HD44780) to a file on phatIO. So you can save “Hello World” to the file and “Hello World” will be displayed on the LCD panel. The phatIO driver is still fairly basic, uses the full 8-bit databus and just maps the HD44780 display RAM to file, but does provide ability to process newlines automatically. An updated driver will be posted later with support for 4-bit databus and using custom fonts. All you need is a phatIO, a HD44780 Display, connection cable, and optionally a potentiometer to adjust contrast. HD44780 LCDs have 16 control pins, numbered 1–16. This example connects them to the phatIO as follows. Back Light LED May be connected straight to 5V in some models or need a series resistor to reduce the voltage - check your product datasheet. Rear of two HD44780 LCD devices showing connections. 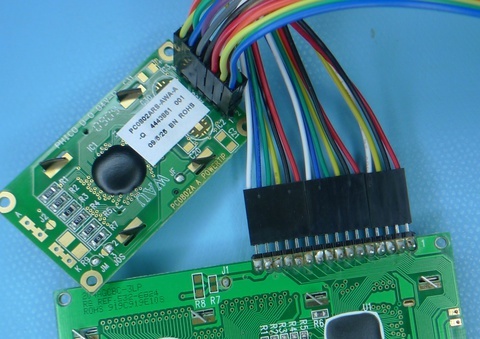 Note that the smaller device uses a 2x14 connector and separate A and K connections on the other side of the board. Copy run.lio to the io directory on the phatIO device. This creates a driver PHATIO/io/dev/lcd when text is written to this file, the screen will be cleared and the text written to it.